Adds spell-scaling based on how many stat points you've invested in Magicka and what perks you have in the Spell School skills. For every 10 Magicka (1 point) you have beyond your starting 100 all your spells become 2.5% stronger. For each individual Spell School the maximum gain that you get this way is capped based on what mastery perks you have: Novice - 12.5%, Apprentice - 25%, Adept - 50%, Expert - 100%, Master - 150%. Only your base Magicka is taken into account - Magicka gained through spells and effects does not count. So lets say you spent 30 points on Magicka for a total of 400 base Magicka, and have Expert Destruction and Apprentice Conjuration. The buffs you get are 75% for Destruction spells and 25% for Conjuration spells. Why make another spell-scaling mod, you ask? I've found that all existing ones tie the benefit either to the level of the skill, the level of the player, or what perks you have. All of these approaches neglect the fact that anyone can achieve maximum proficiency at magic by using the Enchantment stacking exploit. So everyone ends up getting maximum damage without any real investment. By tying my implementation to your base Magicka I make it so that you can stack all the exploits you want, you will only be a powerful mage if you earnestly invest into being one. Also I've made my mod as unobtrusive as possible. The buffs are based on a carbon-copy of the corresponding Alchemy effects. So it should work with any other magic mod that doesn't tamper with the way a spell's magnitude is calculated or outright remove the ID's of the mastery perks. Small fix that should (in theory) reduce the number of potential problems with load order. Added a power that toggles the buffs on and off. It's called "Toggle Mastered Magicka". If it doesn't get added to your character, delete the mod completely from your hard-drive, then load the game and save. After that, reinstall the mod and load your game. Enchantment Fix - I've created an additional mod that removes the issue with enchantments being affected by the buff. This is done by setting the "Magic School" property of the enchantments' effects to NONE. From my testing this also seems to result in the spell schools' perks not affecting enchantments either. The reason for a separate file is that it is VERY likely to not work with other mods that alter the same effects, and I don't know whether there will be any undesired side effects. Bound Weapons - Makes it so that the damage of Bound Weapons scales based on Magicka and Conjuration perks as well. It's a standalone mod that is unaffected by the main file, and it is not compatible with other bound weapon mods (added weapons won't scale, changes to vanilla are overwritten). The exact scaling is contained within a text file named 'Mastered Magicka Bound Weapon Scaling' in the archive. When you gain Magicka or a perk, it can take up to 10 seconds of in-game time (outside of menus) to update the buffs. So don't rush for checking the new power of your spells immediately. The mod has the side-effect of also increasing the power of your enchantments. Use the optinal Enchantment Fix mod if you don't want this. I've noticed that the buffs remain if you disable the mod without deleting it, which can be problematic if you're trying out different mods. 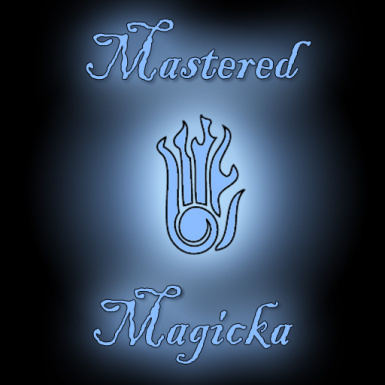 Use the "Toggle Mastered Magicka" power to turn the effect on and off. You should turn the effects off before uninstalling the mod entirely. Balanced Magic by Mysty - fully compatible. Thanks to JRDH who tested this. Mighty Magick Skyrim by Damar Stiehl - incompatible. Spells do not scale at all. Your should use his Scaling module instead.